The Summer issue of Rhythm hits newsstands today, and it's packed with features, lessons, reviews and tips. In fact, it's so crammed-full of drumming goodness that to help get you started we've put together this list of five things you can learn from the latest issue of Rhythm. A Classic Nirvana Track: Thanks to our new-look CD and tuition section you can learn how to play Grohl classic 'In Bloom'. 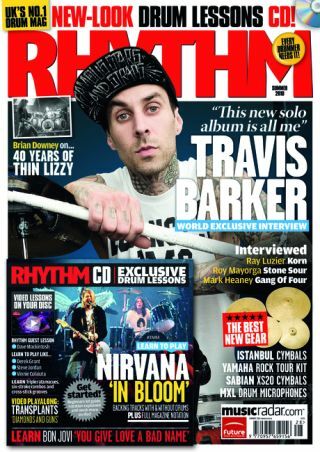 What it's like to work with Travis Barker: As part of our Travis Barker cover feature we've got the lowdown on collaborating with the versatile sticksman from Pharrell Williams, Corey Taylor and Tim Armstrong. The hell that Ray Luzier went through recording the new Korn record: Korn's decision to head back into the studio with Ross Robinson saw Ray Luzier laying down drums in a cramped guitar room, with no click track and occasionally playing one-handed. Read about how he came through it in our four-page feature. Why Brian Downey has returned to Thin Lizzy: The veteran sticksman looks back on first meeting Phil Lynott, hitting the big time with the Irish rockers and the band's latest incarnation. How to play like Derek Grant, Steve Jordan and Vinnie Colaiuta: As well as playalong tracks from Nirvana, Bon Jovi and Transplants, a guest lesson from Dave Mackintosh and a whole load more, we've got tips from our expert tutors on how to play like a trio of drum heroes - Derek Grant, Steve Jordan and Vinnie Colaiuta. For full details of the issue head here, and to order yourself a copy visit www.myfavouritemagazines.co.uk.